Edit (11/08/2018): It appears, that my memory fails me on the details. It must have been late 1996 or early 1997. This week, there was a meeting of the Dredging Management Commission of the CEDA. In this case, the venue was the offices of Femern A/S in Copenhagen1. The objective of the Dredging Management Commission is to provide expertise and guidelines to successfully manage dredging projects. A first publication was the ‘Checklist for Successful Dredging Management’ introduced at the CEDA Dredging Days last November. Currently I am involved in the Working Group on Innovative Dredging Technology2. One of the items on the agenda was a visit to the artificial island of Peberholm. This island was reclaimed in 1995 during the Oresund Link Project, a tunnel and bridge connection that links Denmark and Sweden over the Oresund. A massive complex project, involving two countries, multiple contractors and numerous suppliers. Unlike most of the complex international government projects, the Oresund Link was delivered ahead of schedule and within budget3. At the time, I did my graduation thesis project with Skanska, one of the main contractors. There were also two other students working with Skanska. And as there were a lot of other Dutch contractors involved, the student club of Dredging and Offshore Technology organised a study tour to the project and have a first-hand experience with this landmark project. Returning to these sites with the CEDA was interesting to see the final product after it’s been working for several year in use. On the Swedish side, a bridge was a good solution. On the Danish side, the link would be too close, to Copenhagen International Airport to build a bridge. It would interfere with the flight path of approaching planes. Therefore, a sunken section tunnel was chosen. 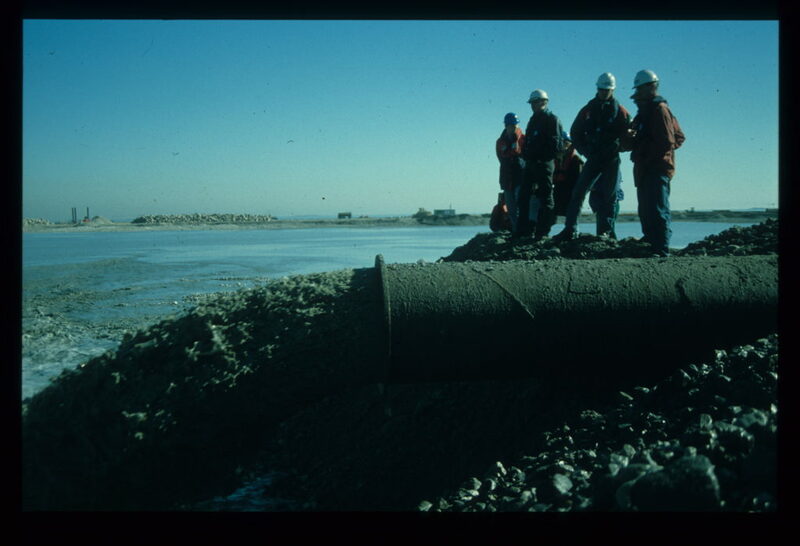 Peberholm was created with fill material, dredged from this tunnel trench. 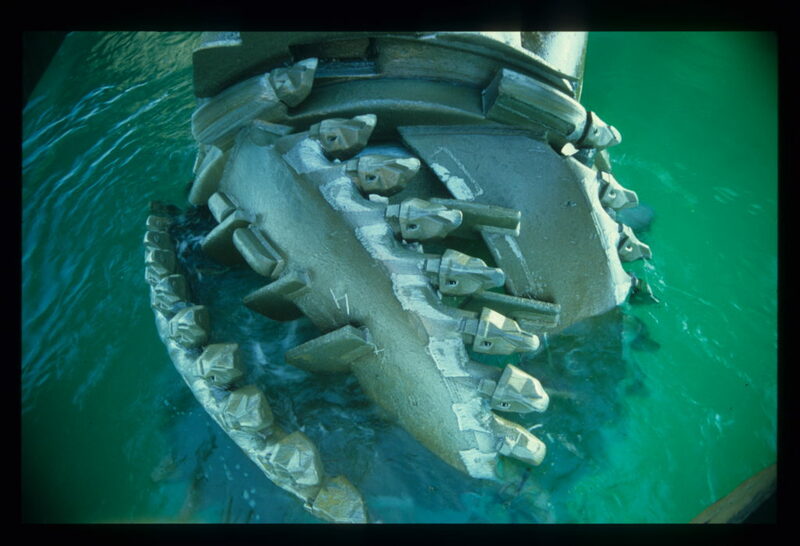 Digging through hard limestone rock, the cutter suction dredge ‘Castor’4 consumed about 62,000 pick points. In the end, they had to exchange all the teeth every 15 minutes, sometimes too hot to handle. 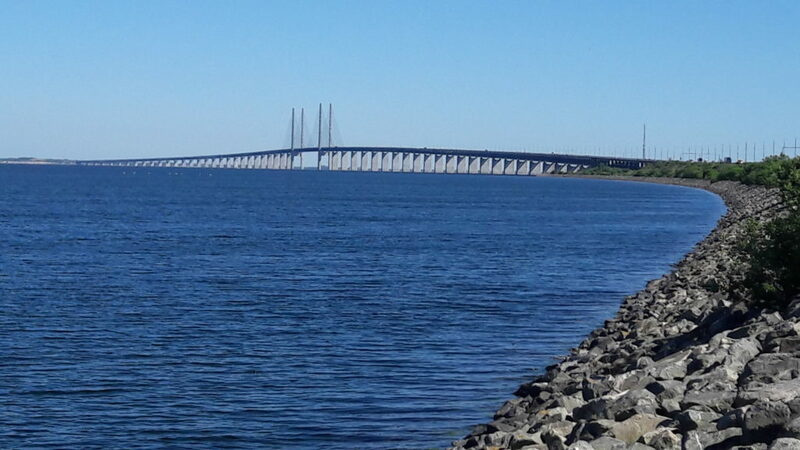 Each pillar and the two pylons of the bridge have a foundation that reaches to the hard bedrock of the Oresund. For this dredging work, amongst others, the back-hoe dredge ‘Rocky’5 from Skanska was deployed. One of the contractual clauses was that turbidity had to be reduced to an absolute minimum, never seen before in any contract. Although protesting, the contractors complied and did a great job on reducing turbidity. The loose material from the bottom and the rubble from the bedrock created visual plumes anyway and Skanska had to modify their procedures and equipment to reach the stringent standards. Left, Back hoe dredge ‘Rocky’. Middle, bucket of crushed limestone. Right, Spill plume. 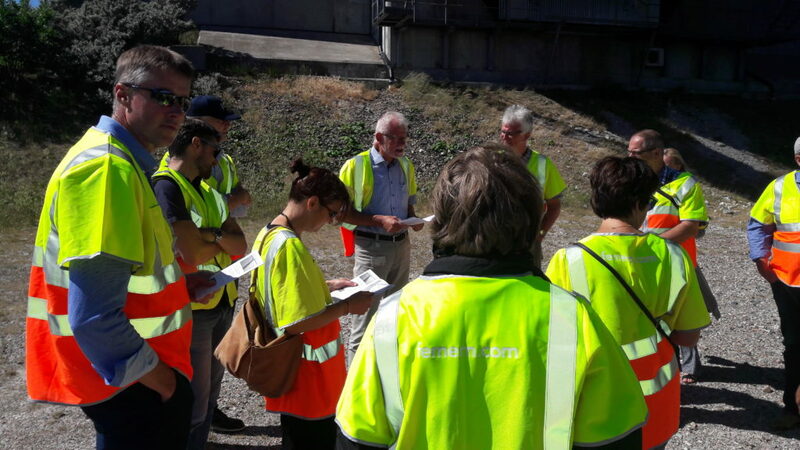 It was fitting, that we visited the location of this impressive project as inspiration to advice how to successfully manage a dredging project. The next step to test the management skills of the Danish people will be the Fehmarn Belt Project6. Panoramic view from Peberholm. Denmark left, Sweden right and Saltholm in the middle.